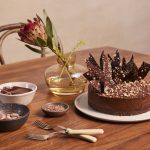 To celebrate Veganuary, the Baileys Treat Collective member, Lucie Bennett, has created an indulgent vegan chocolate cake, made with Baileys Almande, cacao and avocado. Lucie’s delicious and indulgent vegan treat will ensure that you to start the year off with a bang, just follow the recipe below to make your own free-from treat at home. This indulgent vegan chocolate ganache cake is dense, rich and just a little bit boozy! To make the base, line the base of the tin with baking parchment and lightly grease the sides of the tin with oil. In a food processor, blend the almonds and dates until they have broken down in small pieces. Add the coconut oil and maple syrup and blitz until combined. Press down the mixture with the back of a spoon in the tin until smooth and level. To make the ganache, place the chocolate in a bowl. In a saucepan, bring the Baileys Almande and maple syrup to the simmer, pour over the chocolate and stir together until smooth, allowing to cool. In a food processor blend the avocados until smooth and then add to the ganache, pulse until smooth. Pour mixture into the tin and place in the fridge and allow to set for 3 hours. Once set, carefully remove the chocolate cake from the tin. Return to the fridge. To make the shards for decoration, turn a small baking tray upside down and line with baking parchment. In a bowl, melt the chocolate over a pan of simmering water and once cooled, decorate the top of the chocolate cake. Dip a teaspoon in the chocolate and drizzle over the ganache cake, creating chocolate swirls on the top. Then pour the remaining chocolate onto the parchment, evenly spread to the edges of the tray with a step pallet knife, sprinkle half the chopped almonds and bronze crunch. Place another piece of baking parchment over the top of the chocolate and place a chopping board on top, this will keep the sheet flat. Set in the fridge for 20 minutes. To serve, remove the baking parchment from the base. Place on a cake stand and decorate with the remaining toasted almonds and bronze crunch. 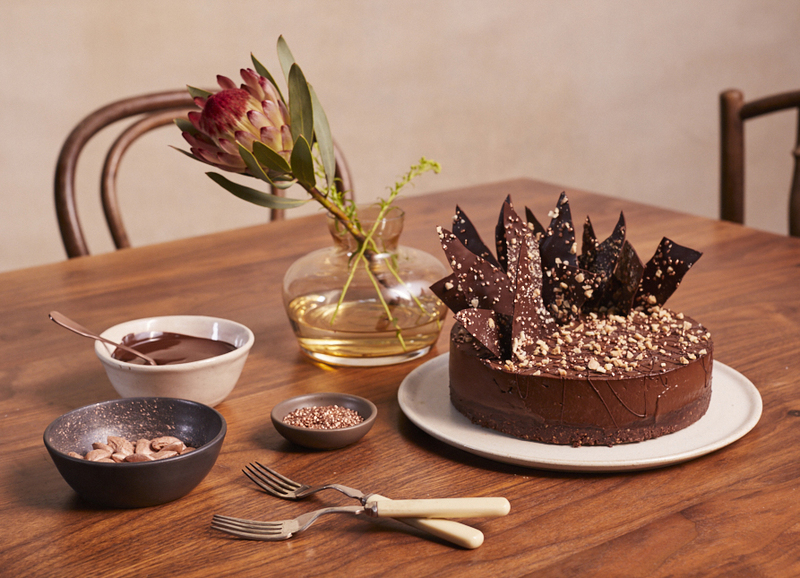 Gently break the chocolate sheet into jagged pieces and on one side of the cake, push the shards into the ganache a little they stand up and serve.